We are two Aussie guys who absolutely love the house sitting lifestyle. We have been house sitting full time since May 2016, starting in New Zealand. Since then we have cared for homes and pets in Australia, USA & Mexico. We have met some wonderful home owners and their pets and are willing to consider any house sitting opportunities across the globe. We enjoy experiencing things ‘as a local’, and with our love of travel and animals, house sitting ticks all the boxes for us, whilst allowing our home owners to have worry free holidays and trips. We are clean, tidy, responsible and non-smokers. We both love animals, particularly cats and dogs (especially golden retrievers and border collies). We are both happy to take care of your garden and lawn as well. We both work online, so a reliable internet connection would need to be available at your home so that we can continue our work. Click here to download our letter of introduction, references and photo gallery. I finally managed to get Christopher and Andrew as housesitters – it was tricky getting them between their other housesitting engagements!!! Between Muggles duties, they kept the house clean and tidy, kept some precious plants alive and even patched an unwanted mini trench which had appeared in my ‘bush’ driveway!! Muggles keenly awaits their return. And I’m delighted to have housesitters who cope well with a semi rural environment (tank water and septic system). Christopher and Andrew were the perfect house sitters. We were put at ease as soon as we met them; they were extremely knowledgeable about the house sitting role and their professionalism and experience made the sit for us a worry free time as we knew our home and Marley were in safe hands. Christopher and Andrew asked all the appropriate questions to make the handover go smoothly and ensure there were no issues while we were away. Throughout the sit we received regular updates and pictures of Marley who we could see from pictures was very happy whilst we were away. Our home was immaculate when we returned and Marley very chilled out. We would have no hesitation in recommending Christopher and Andrew for any house sit. Thanks for the wonderful job you did for us and Marley ! We “met” Andrew and Christopher (aka the Global Wanderers) on housecarers.com. They were interested in a white Christmas in Europe and reached out to us within days of our post, after which time they organized a Skype session so that we could get acquainted and to see if they / we were a good fit. Needless to say, we quickly hit it off with our fellow Aussies and everything was agreed 6 months in advance. In the ensuing months, Andrew and Christopher made sure they stayed in touch and kept us informed about their travel plans so that we never doubted that they would actually show up at our door. Again, in the weeks leading up to our departure, the Global Wanderers reached out to finalize the logistics of the housesit. They arrived in Basel the night before and stayed in a nearby hotel, and before we left we spent several hours together so they could meet our dog, Alaska, and so that they could familiarize themselves with our small apartment and the surrounding area. They took the initiative to set up a WhatsApp group so we could stay in touch. During our vacation, Andrew and Christopher sent us messages with photos of Alaska to let us know that everything was ok. The Global Wanderers spent 2 weeks minding our apartment and our dog in Basel, Switzerland. They were very prompt, reliable and showed integrity. As experienced house sitters, they are very organized and show a lot of initiative, which obviously put our minds at ease. They took very good care of Alaska and our apartment, leaving it as they found it. Alaska clearly loved her new companions and didn’t want to say goodbye. We can highly recommend them, and will gladly reach out to them in future if they are available and interested. We can’t begin to express our gratitude for the excellent job Andrew and Christopher did pet sitting while we were away. We felt 100% confident with them while we were away. They kept us updated on how Tyson(dog) and Beaux (cat) were doing while we were away. Upon our return we found our animals healthy and clearly had fallen in love with their temporary parents. They walked Tyson everyday and Beaux followed along quite often. Not only where our pets in excellent condition but our home was spotless!!! I have already asked if they are available for next year. I assure you, you will not find better house/pet sitters than these two fine gentleman. Thanks for allowing us to have a worry free vacation. Andrew and Christopher house sat for us for a month and we were extremely happy with the service they provided. They were very prompt and easy to communicate with, and very friendly and professional once we met. On our return, the house was clean and tidy, and it was obvious the two dogs liked them and had been well cared for. We have no hesitation recommending them to others who are looking for someone to house sit for them. We were bound for a 3 week family holiday to the USA and were anxious about leaving our dog, Casper behind. Luckily we were introduced to Andrew and Christopher through a mutual friend. Our initial contact with them was very positive through a skype call where they asked all the right questions. They also made the effort to meet us and introduce themselves to Casper before we left. These interactions gave us confidence that they knew what they were doing. This confidence was well founded as it transpires as we returned home to a happy dog who was clearly happy to be with them and our home was returned to us in immaculate condition. We would be pleased to recommend them for pet and house sitting. We hope they enjoyed being with Casper and living in our home as much as we enjoyed the peace of mind of them being there. I have to say we could not be happier with Andrew & Christopher pet (house) sitting. I had to overcome my concern about complete strangers looking after our two cats whilst we were away for 7 weeks in Europe. But from the initial contact (which was always quick) they put our minds at ease about their capabilities. Even at the interview (when they came to the house) they easily put me at ease and the cats (one of whom is extremely shy) even came out and got a pat (never happened with strangers so quickly). Whilst we were away Andrew and Christopher looked after our home and cats as if they were their own – they sent us regular updates (with pictures) that helped whilst we missed our cats from afar. When we got home late in the evening, we arrived to find the cats happily content, sitting on their laps and enjoying a comfortable evening. The house was spotless (maybe better than when I left it) everything was in order, and Andrew and Christopher were even considerate to put some milk, bread and home made soup for us to enjoy after the long haul flight. We have no hesitation in recommending Andrew and Christopher to anyone who wants quiet (no complaints from any of our neighbours) and animal lovers to mind their precious fur bundles. We will definitely be using them in any future holiday we plan. It is with pleasure that I write this reference for the boys at Global Wanderers – Christopher and Andrew. 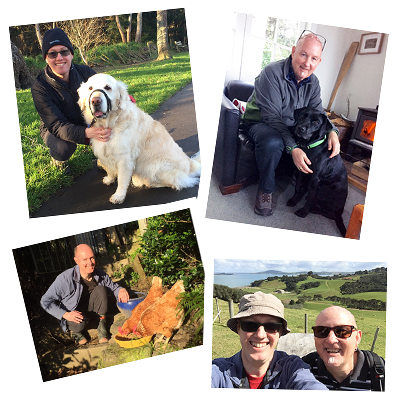 Christopher and Andrew housesat our home and four legged family member – Chandon – for 10 days in the month of April 2018 whilst we visited family members in New Zealand. After never having had a house sitter before I really did not know what to expect, but I was more than pleasantly surprised in our total experience. Christopher and Andrew met with our family two weeks before the house sit and ran through everything our house had to offer and also the requirements of our 8 year old Weimaraner – Chandon. Their approach to the services they offer is very thorough and very professional. They ask and take notes on everything. Whilst we were away they kept us up to date with photos and messages of how things were going and more importantly what Chandon was up to. The house was left in a pristine condition on our arrival home. I would highly recommend the boys for any of your house sitting needs and hope that next time we travel they are in Sydney and free for when we need them. They truly offer a unique service and we now understand why they are in demand all over the world. My wife and I (and our three children, and especially our golden retriever!) are enormously fortunate and grateful that we discovered Christopher and Andrew on Aussie House Sitters. We had an overseas holiday planned where we would be away for two weeks and we wanted to try the housesitting option so our beautiful dog could be cared for, our house looked after, and our garden kept alive during a dry spell. We had never used house sitters before and we were unsure what to expect. To be honest, we were a little nervous about the prospect of having people we’d never met before live in our home while we were away. But the moment we met Christopher and Andrew (via skype, initially) all our worries were put at ease and we knew that not only were they an experienced and safe pair(s) of hands, but they were genuinely lovely people too. Our house was impeccably looked after, the garden still thriving, and most importantly our dog looking happier than ever (we suspect he had more walks with Christopher and Andrew than he normally does with us!). They picked us up from the airport, and we returned home to a clean house (again, likely cleaner than when we left a fortnight prior) and fresh fruit. We highly recommend Christopher and Andrew, and we will most certainly be looking them up the next time we go away. A+ endorsement from us! Ed and I were very fortunate to have found Andrew and Christopher to house and pet sit for us. We had never met them before but saw their email on our local chat list here in San Miguel de Allende. We contacted them and arranged for a Skype call. We knew after our brief conversation that they would be excellent and reliable sitters. But even knowing our house and pets would be in good hands, we were not prepared for the wonderful all-around experience we had with them. Not only are they professional in their approach to house sitting, but they are delightful people with whom we could share many things. We are fortunate to have a maid and a gardener and they treated both with respect and kindness. And our dog, Princess, and three cats were obviously well taken care of in our absence. Princess, our dog, still goes into their bedroom looking for them. Our house and car were well kept in our absence and Andrew and Christopher kept us informed about repairs that needed to be done in our absence and important calls that came in that we needed to respond to. We highly recommend them and know that we will definitely have them house sit for us again. I know we may sound like a broken record, but I just have to repeat myself again by saying you are both absolutely fantastic! Knowing that you were taking such wonderful care of our five beloved pets truly enabled us to enjoy our five weeks away this past November/December. One always enjoys going away but having peace of mind that such caring individuals as you two are taking such care of our home and pets only added to our relaxation. We are so happy that you had an opportunity to meet people in the community and every single person that you had contact with in your five weeks here has mentioned what wonderful people you both are. You both definitely left an impression on so many people. Anyone lucky enough to have you both as house/pet sitters will never regret it. It will will hard for any other sitters to come close to you. We already miss you and hope our paths will once again cross. If you ever plan to return to Mexico, please let us know and we will gladly book a vacation so our pets can once again enjoy your loving care. We wish you happy trails in 2018. Travel safely! My husband and I engaged the services of Christopher and Andrew for a house sitting job in our home in Palm Springs, Ca. We have a large home and a 13yo Cockapoo we wanted to have looked after while we travelled overseas in August/September 2017. I have known Christopher (20+yrs) and Andrew (10+yrs) both personally and professionally while I resided in Australia between 1989-2010. I had no reservations calling on them to look after our most precious things when the time came. Christopher and Andrew were both personable and professional in their approach to looking after our fur baby and property while we travelled. Their attention to detail is impeccable in regards to our pets needs and our home. They went over and above when faced with an unexpected rain storm here in a Palm Springs, which resulted in flooding in the area. The guys were quick to do what they needed to do which included digging trenches in the middle of the storm to allow water to escape our back yard and stop the house from flooding. We were ever so grateful. In addition, we had some deliveries arrive while we were away. One of he deliveries was an order for some new barstools. Christopher and Andrew, without even thinking twice, offered to unpack and assemble these with our permission. We returned to an exceptionally clean home and a very happy dog! We couldn’t have asked for more! I highly recommend Christopher and Andrew for any house/pet sitting job you may have now or in the future. My wife and I were absolutely delighted with Andrew and Christopher, The Global Wanderers, and their care of our home and vehicles. They left our home in immaculate condition, and they are personable individuals. My sister showed them around town a bit, and now she misses them. They are simply very nice guys. If you engage them as housesitters we have no doubt that you would be impressed with their care of your home and attention to detail. We would not hesitate for an instant to hire them again. We were privileged to have Andrew and Christopher look after our home during our extensive travel around Australia. We came home unexpectedly during our trip and were delighted to walk into our home as if we had just been out for a few hours. When we finally returned, at the end of our trip, once again, the house was spotlessly clean and the plants that we usually try to kill were flourishing. They certainly went the extra mile to ensure our homecoming would delight us. We would certainly recommend their house sitting and look forward to having them again. My wife, Lesley, and I cannot recommend Christopher and Andrew highly enough. They took wonderful care of our house and garden for two months while we took a well deserved holiday. Our two dogs were pampered and loved. Although not part of the deal they were kind enough to keep a watchful eye on an elderly relative who lives separately on the property. There was great communication and pictures to keep us in the loop. What topped it all off was that these two gentlemen were just that – gentlemen. Andrew and Christopher looked after our house and silly puppy earlier this month while we were overseas. Oddly, it only struck me once we were away that I didn’t have a single concern leaving them with all of our belongings. And my intuition was right; they are trustworthy, lovely, funny, responsible and kind. When we got home the entire place was tidy, the dog was happy – everything in the house felt good: people had been here who cared. They were also in contact with us while we were away to let us know that everything was ok. I was impressed, and grateful. I’d unconditionally recommend Christopher and Andrew to anyone who needed house-sitters. Andrew & Christopher recently looked after our naughty girls Maisie & Bluebell and our dusty Queenslander house in Brisbane. What a remarkable job they did! We were very fortunate to spend two days with them too and they have become firm friends. We had regular updates on the antics of our fur babies along with photos which was fabulous. They loved our babies like we do! The dusty house has never looked so clean and will never look that way again! We highly recommend these guys and we are so lucky to have made two such lovely friends. Andrew and Christopher looked after our Darwin home for the past 4 weeks. What can I say….they have been just fantastic. We met the day prior to us flying out and I knew we had the right people for the house sit. Really good guys and they have looked after our place better than we do ourselves. They kept us in touch with a few text messages and reassured us that all was in hand. We returned to a super clean home, tidy garden and clean sheets on our bed. Even our grumpy old cat seems oddly happy! Would have them back in a heartbeat – thanks you 2! Christopher and Andrew have house sat for us twice and we fully intend to use them again. They not only are respectful of our house but are wonderful with all our pets and during this last house sit had to take care of our ailing cat. And because of an emergency in our family this last time they housesat we had to leave before they were to arrive. Their familiarity with our house and pets made this go smoothly. I cannot recommend them more highly and will look forward to having them back again soon. Christopher and Andrew took amazing care of our cats and our home and I cannot recommend them enough! The cats were well fed and well loved whilst we were away and Christopher and Andrew were very respectful and left the house very clean! We were so lucky to have Andrew & Christopher housesit for us again. I think we were the first resit they have done! They looked after Nellie (Airedale) and our two cats Maisie & Bluebell not to forget Madge & Beryl (chickens). We highly recommend this wonderful couple who treat your home with the utmost respect. Christopher and Andrew were fantastic pet sitters while we were away for 2 weeks. We used them on a recommendation from a friend, and we were very pleased that they lived up to the praise! We would get periodic photos of our 2 cats which was unexpected at first, but reassuring, and we looked forward to the next update! In addition, they were as neat as a pin, and when we arrived home after 2 weeks, we found our house just as we had left it…or perhaps even a little cleaner. Thanks again guys, I can’t wait to go away on our next trip! We have never had someone house sit our house or our animals before – so this was a leap of faith for us. We were off overseas for the first time in many years and we didn’t want to put our pets in kennels for such a period of time. From the first conversation we had with Andrew and Chris we were convinced that we needn’t worry. They understood our concerns, particularly in regards to looking after our pets, they made great suggestions on timing so that we had a good overlap with them either end and they adapted their schedules to make it easy for us. They arrived a couple of days ahead of our departure which was a great idea because it gave, our dog in particular, time to get to know and trust them. So by the time we left we had total confidence in them. While we were away they had to make some decisions on taking one of the cats and the dog to the Vet. They made competent decisions and they kept us informed all along the way. Again they took care of everything. We met them again on our return and everything about the house was immaculate and the animals had clearly been looked after lovingly. We would highly recommend Andrew and Chris to others looking for careful, pet-loving, kind people to house sit your house. Absolutely fabulous and amazing guys … and now we will remain as friends…my dog and chickens loved them too! We could not speak highly enough of Andrew & Christopher. They looked after our house as if it was there own, and we came home after 4 weeks overseas to a well maintained garden and lovely clean house. Our pet Golden Retriever “Rocket” obviously enjoyed his pampering as it has taken us a week to stop him going into the boys room looking for “pats”. We can highly recommend Andrew & Christopher and would welcome then back at anytime. Andrew and Christopher were exemplary custodians of our home. They stayed in touch with us during our trip overseas and were kind enough to pick us up from the airport upon our return, the property was clean and well cared for. Our pet chooks were happy, plump and pampered! We would not hesitate to have them care for our property again and can in good conscience recommend them to anyone considering house sitters. Andrew and Christopher came to stay in my home and mind my two indoors-only Birman cats while I was away for 10 days in October 2016. I have had many house/pet-sitters over the years, but none as outstanding as Andrew and Christopher! They took such wonderful, loving care of my beloved cats, sending me regular updates and photos. Nothing was too much trouble and they coped with my rather ‘special needs’ boy cat brilliantly and with the utmost of patience, love and understanding. When I returned home, my apartment was spotless – in fact, it was even cleaner than I had left it! The bed was all made up for me, the extra towels and sheets were washed and folded, there was milk in the fridge and flowers waiting! And most importantly, two very happy, beautifully looked after cats were waiting to greet me! Andrew and Christopher are well experienced, truly professional house/pet-sitters. They take pride in taking the utmost care of your home and pets and will easily adapt to whatever kind of home or pets you may have. Having them to housesit means that you can fully enjoy your holiday or time away from home, knowing that everything is in the best of hands. I would recommend Andrew and Christopher as highly as possible. If you are looking for the perfect people to care for your home and pets, look no further! I only hope that I am fortunate enough to have them come to stay during my future holidays! They are quite simply, the best!